Initial HE Shell Velocity700 m./s.
. . . Firing Range0.36 km.
. . . Firing Range0.3 km. Bougainville — French Tier I cruiser. The largest and most powerful representative of the aviso type, the French Navy equivalent of sloops and gunboats. This warship was intended for colonial service abroad and carried armament that was quite good for her size. 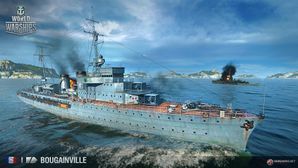 The gateway to the Marine Nationale in World of Warships starts here with Tier I's Bougainville. She represents a class of avisos (dispatch boats) that were constructed in the 1930s, and her most redeeming quality is that captains won't have to play her for very long. Bougainville is unquestionably the weakest of the Tier I cruisers. She has a long rudder shift time and slow top speed to go with a weak main battery armament and almost no armor protection to speak of. Her speed and rudder shift time combine to make her handle sluggishly for a Tier I ship — especially compared to the likes of Black Swan or Orlan. She can be easily citadeled at nearly any angle, even by high explosive rounds. Spending time playing Bougainville isn't enjoyable, but at least captains won't have to suffer very long. It is fortunate, then, that Tier II's Jurien de la Gravière is a more enjoyable ship. Largest health pool of all Tier I ships. Highest shell damage of all Tier I ships. Highest AA DPS of all Tier I ships (not that she will ever see an enemy aircraft carrier). Slowest Tier I ship (together with Black Swan and Chengan). Fewest main battery guns of all Tier I ships. Bougainville only has one upgrade to research: a 10% range boost offered via an improved Fire Control System module. It is best not to bother investing any experience there and devote all experience gains into unlocking Jurien de la Gravière as soon as possible. With only one upgrade slot, options are limited. Captains who wish to invest the credits for the game or three they will spend in Bougainville are advised to equip Magazine Modification 1 ( ) in Upgrade Slot 1. Bougainville only has access to the Repair Party consumable. Spending credits on the premium version is really a waste and not recommended. Bougainville was the lead ship of a class of nine (ten planned) avisos of the French Navy, launched on 25 April 1931 and commissioned on 15 February 1933. The ship was designed to operate from French colonies in Asia and Africa and was initially stationed in the Indian Ocean. In 1935 she was transferred for service in the eastern and southern Mediterranean, and in early 1939 to Djibouti, returning to Toulon escorting a group of submarines after the outbreak of World War II. She sided with Vichy France and was sunk off Libreville by her sister ship Savorgnan de Brazza on 9 November 1940 in the Battle of Gabon. Although she was refloated in March 1941, she sank again and remained so until she was broken up for scrap in 1952.